Frederick William Varder was born in the spring of 1889 at Yeovil. He was the son of Philip Henry Varder (1860-1896) and Louisa née Gummer (b1858, Westport). In the 1891 census Philip, Louisa and 2-year old Frederick were listed as lodgers at 24 Hendford. Philip listed his occupation as 'Grocer's Outside'. He died in 1896 and in the 1901 census Louisa was listed as a widow living at Hyde Farm, Sutton Bingham, where she worked as the housekeeper. 12-year old Frederick lived on the farm with her. In the summer of 1901 Louisa married John barter Ridout at Yeovil. By the time of the 1911 census 22-year old Frederick was a dairy worker, living with dairyman John Clarke and his family at Closworth. On 10 December 1911, at Halstock, Dorset, Frederick married Bertha Jane Udall (1888-1959). They were to have a son and a daughter; John (1914-1976) and Frances (1916-1998). 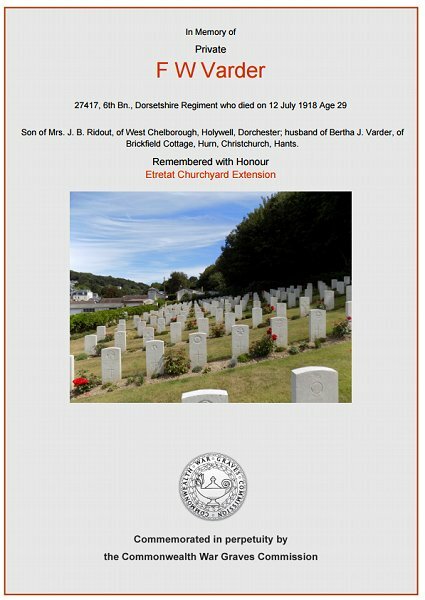 Frederick enlisted at Bridport, Dorset, giving his residence as West Chilborough, Evershot, Dorset, joining the 6th Battalion, Dorsetshire Regiment. His Service Number 27417 suggesting he enlisted at the end of 1917 or the beginning of 1918. In 1918 the 6th Battalion, Dorsetshire Regiment were in action in the Battle of St Quentin (21-23 March 1918) and the First Battle of Bapaume (24-25 March 1918), both were phases of the First Battles of the Somme 1918. The Battle of St Quentin began the German's Spring Offensive on 21 March 1918. It was launched from the Hindenburg Line, in the vicinity of Saint-Quentin, France. Its goal was to break through the Allie lines and advance in a north-westerly direction to seize the Channel ports, which supplied the British Expeditionary Force (BEF) and to drive the BEF into the sea. Frederick died of influenza on 12 July 1918, at the beginning of what was to become the Influenza Pandemic of 1918. He was aged 29. 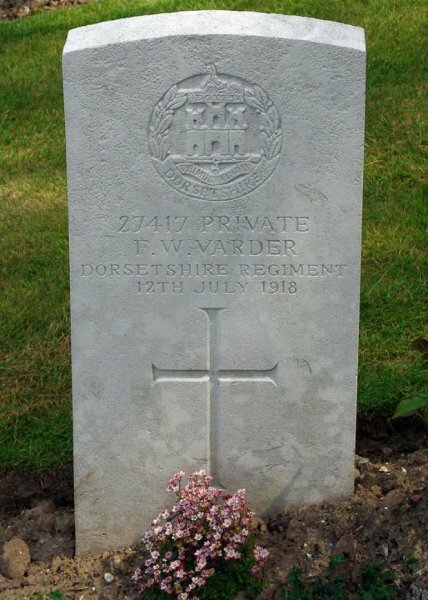 Frederick Varder was buried in the Etretat Churchyard Extension, France, Grave II.E.14. His name was added to the War Memorial in the Borough in 2018. The Commonwealth War Graves Commission certificate in memory of Frederick Varder. Frederick Varder's Commonwealth War Graves Commission headstone at Etretat Churchyard Extension, Seine-Maritime, France.